Are you looking for an excellent wedding anniversary gift for your spouse? Let us create a beautiful leather photo album to commemorate your years together, and preserve the events and times that are special to you. We can take whatever art or theme that you may want to use to create a personalized photo album that will become a treasured keepsake for years to come. If you'll be having an event to celebrate, you may want to consider using the same album as a guest book. Our photo and guest book pages are interchangeable, mixing them can really add a special touch to a book. We will be happy to build custom guest book pages for whatever the occasion may be. 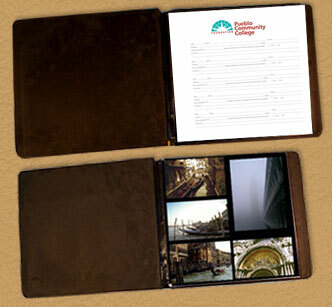 Give us a call to discuss how we might build a special personalized photo album for you. 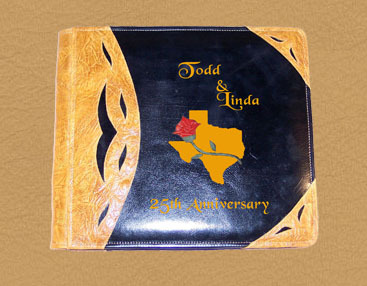 There are a lot of leather guest books out there, but have you ever considered using a photo guest book? It's always nice to have the names and comments of the people who've been a part of your occasions, but photos really add a nice touch to it all. We've combined our two best products to make something truly special. We'll create for you any custom guest book page layout that you like in addition to cover personalization. If you'd like to mix in photo pages with your guest book pages it is a great way to spice up your book. You may also do this after the fact. Consider taking some nice shots at your event, or of fun times had wherever the book may be in service to mix in with the guest book pages. These books are great for weddings, anniversaries, cabins, ranches, or wherever you might have some images to associate with your guest list. Hunting experiences are among the most cherished a father and son can share together. Memories are created that last a lifetime. Our beautiful leather photo albums are handsome and lasting keepsakes within which to preserve these precious memories together. Memories like the drive to the ranch, rising before the dawn, chilly sunrises in the hunting blinds, and tagging your first trophy buck may be treasured for a lifetime within a custom made hunting photo album from Powell Leather. Our Leather photo albums are crafted from the finest materials available to offer a lifetime of faithful service. 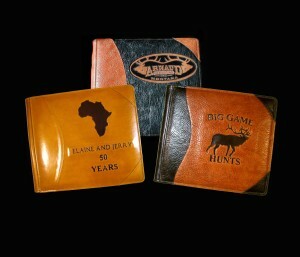 Your hunting album's cover may be custom designed to reflect the experiences that made your hunt such a special memory. On the coffee table, the mantle, at the lease, or in the lodge, our handsome albums will become a part of your life to be treasured for generations to come. Just give us a call, and we'll create an album as personal and unique as the experiences that you've shared together. 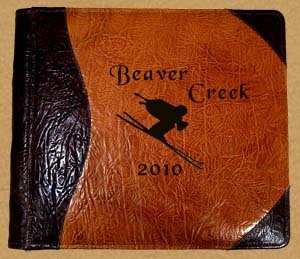 Leather Photo Albums for Skiing! Sometimes it's hard to find the perfect photo album for each vacation or event in your life. We do a pretty good job of solving that problem for our customers. If you're trying to find the right leather photo album for your ski pictures, we will build a personalized leather photo album just for you. Give us a call to discuss where you've been and what you're looking for, and we'll design an album cover that has the personality that you have in mind. We'll make for you the most beautiful ski vacation photo album that you've ever seen!